Jazz is delivering its valuable services to valuable customers in all possible means and that is why it has been a leader of cellular competition. Along with Jazz call packages, Jazz internet packages are also the mark of these valuable services. This is the detailed review of Mobilink internet packages and customers will not find any confusion about finding that how they can subscribe, what are the charges of these packages and what is the validity period? Customers can enjoy GPRS packages for full day, for a whole week or a month. Read the details of each review and rejoice with Mobilink GPRS packages. Well, feel free to renovate your sentiments with this unlimited daily GPRS bundle offer. There is no time window that this package is going to end up. It is an unlimited offer, which means no boundaries of data surfing on the web. You will have to pay just Rs.9.99 for 24 hours for subscription to this bundle offer. To subscribe, dial *114*1# from your Mobilink number. Unlimited data surfing means a fair usage policy of 200 MBs will apply. To check the expiration time and remaining MBs in your account, you can dial *114*1*2#. Un-subscription process of this package is to dial *114*1*4#. It is backed with an auto subscription process, so no bothering of subscribing it again on next day. Jazz and Jazba subscribers can avail this offer. This offer is valid only for prepaid subscribers. Yes, you have a complete week of enjoyment with Jazz weekly GPRS Bundle. Like many other offers of Jazz, this one is relatively appreciated by the Mobilink family of prepaid customers. No issue with this package as it is also very simple to subscribe. You just need to have a glance over the following details. It is a weekly bundle offer which means it will expire after 7 days from subscription date. You can use 500 MBs of internet data after availing this weekly bundle. Charges for this package are Rs.29.99. No taxes are applied on all internet package charges. For subscription to this bundle, dial *114*7#. For balance inquiry of remaining data units and expiry date/time, you can dial *114*7*2#. For the complete details of this bundle offer, you can dial *114*7*3#. Un-subscription to this bundle will be made as *114*7*4#. Each inquiry will be charged for 15 paisas plus taxes. 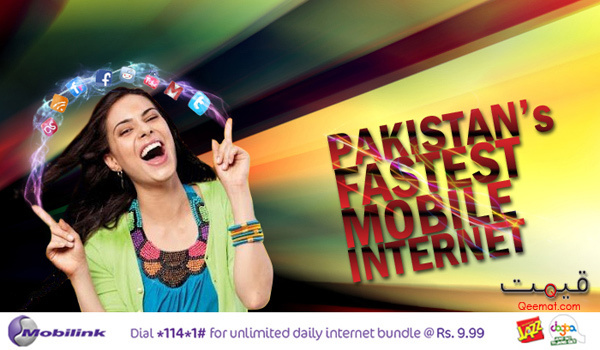 And the chain of Mobilink internet packages goes on with this monthly GPRS bundle. You are given maximum units of MBs to enjoy for a period of 30 days from the date of subscription. This monthly GPRS bundle is also very economical and Jazz customers are at ease of using Mobilink services at full passion. Read following details of this monthly bundle and see if your mind clicks to activate it. You can use 200 MBs of internet data after subscribing to this monthly bundle. You are charged for Rs.99.99 for 30 days of this bundle. For subscription, you can dial *114*30# and this bundle will be activated for 30 days. If you want to check that how many MBs data is left in your account, you will have to dial *114*30*2#. If you want the details of this package to be displayed on your mobile phone, you can dial *114*30*3#. If you want to UN-subscribe monthly GPRS bundle offer, dial *114*30*4#. As the name specifies, it is a night offer from Mobilink and you can enjoy surfing the web for whole night. Unlimited data given to your account after you have subscribed this bundle offer. There is a time frame of using the unlimited MBs (200 MBs) on your mobile phone and complete details are mentioned in following lines. This is unlimited offer available for one day. Time window is limited from 12am to 8am. Charges are Rs.3.99 for these 8 hours. For subscription, you can dial *114*2#. For checking the remaining MBs and other details, you can dial *114*2*2#. For seeking information about late night offer, dial *114*2*3# from your mobile phone. Un-subscription can be made through dialing *114*2*4#. @noreen 10 Rs mein aap 200 MB inernet use kar sakti ho,24 hour a day,jazz budget packg pe. @saim Aap helpline 111 pe call karen,wo khud helpline se aap ko package laga denge. kia 9.99 me 24 hours net use kr sktay hain jin k package Jazz budget hai?